I love most of the books coming from the Choc-Lit Publisher and this one is really no exception. I adored it. Five stars! 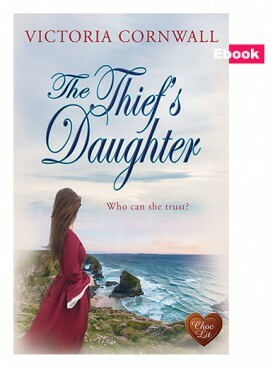 This is a powerful book in which the author, Victoria Cornwall, takes her readers smack bang into 18th century Cornwall. She places you firmly on the beach with the thundering waves during a smuggling and wrecking operation. This is a book that you live as you read. Jenna is a memorable character--feisty, daring and loyal. She's seen her husband hanged for poaching and enough of the "dark side" to know that she will never be a part of it. Yet if your family are thieves then you can never escape it. When her brother needs help, she enters the smuggling world for him. She meets lovely Jack Penhale whose aim in life is to rid the Cornish coast of these illegal traffickings, and so she is stuck in between falling for him and loyalty to her brother. These characters will remain with me for a long time. Their struggles with a life that includes cruel punishments, workers' fayres (where women stand on a podium and are sold to the highest bidder) are in such strong contrast to the wonderful but wild landscape of Cornwall. I don't usually read historical novels but I thoroughly recommend this book for those who enjoy an excellent, nail-biting read.